Today's card for the Freshly Made Sketch Challenge is a bit deceptive, and because of that, I'm also entering it into this week's CASology challenge. The deceptive bit about this card is that all the squares are masked and sponged so while it looks multi-layered, it's actually pretty CAS! I cut masks using square nesties and acetate and sponged Cajun Craze and Old Olive ink in the smaller squares and Crushed Curry and Cajun Craze in the large square. Keeping the masks in place, I then stamped the water droplets image in Smokey Slate. I then went around all the squares with the fine end of my Basic Black marker and a ruler. The leaf was stamped in Old Olive and sponged before being cut out. After it was cut, I ran around the edges of the leaf with Basic Black marker. 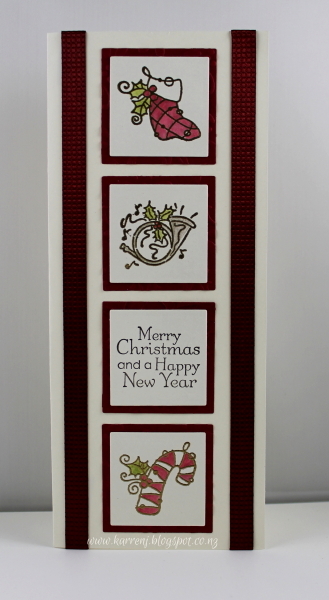 The sentiment was stamped onto Whisper White and cut out using one of the Labels Nesties. 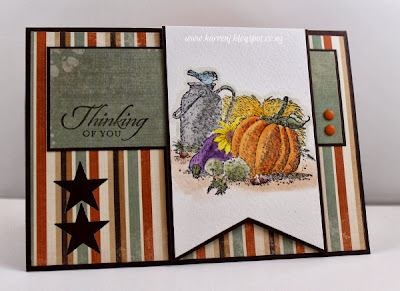 It was all layered onto a Cajun Craze card base. If you look carefully, you can see that my squares aren't exactly perfect. I started out measuring and calculating, but I spend my working week calculating and working with numbers and didn't want to do it on my weekend so I just decided to eyeball it. This is a quick post before I head off to work. My card today uses the sketch from Just Add Ink and the colors from ColourQ. 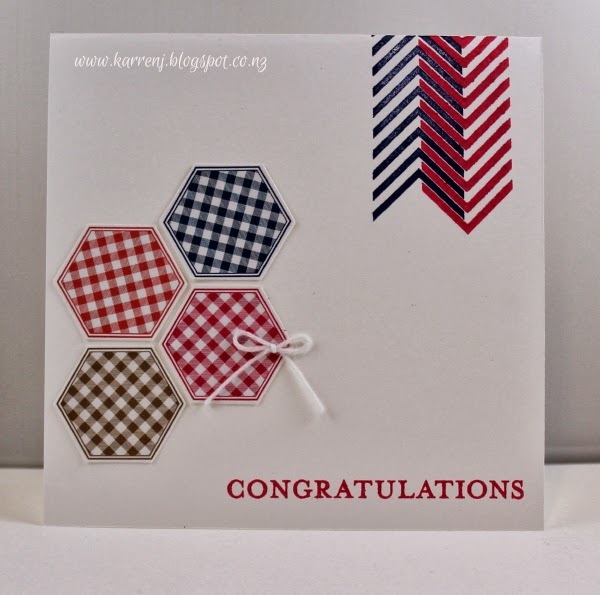 I have to say it's not very original - I stuck to the sketch - even down to the hexagons which I printed out of MDS as I don't have the hexagon set. I did use Border Banter for the banners stamping the arrow banner twice - once in Strawberry Slush and once in Night of Navy. Not much else to say about this card. Thanks for looking. 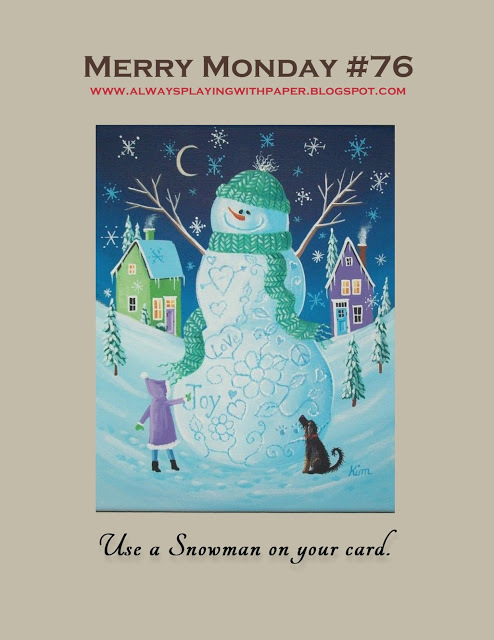 The challenge this week at Merry Monday is to use a snowman on your card - not too difficult when making Christmas cards, right? I pulled out another old, old stamp to make my card. This one is from PSX - one of my favorite stamp companies of all time. I have many, many PSX stamps and will never get rid of them! 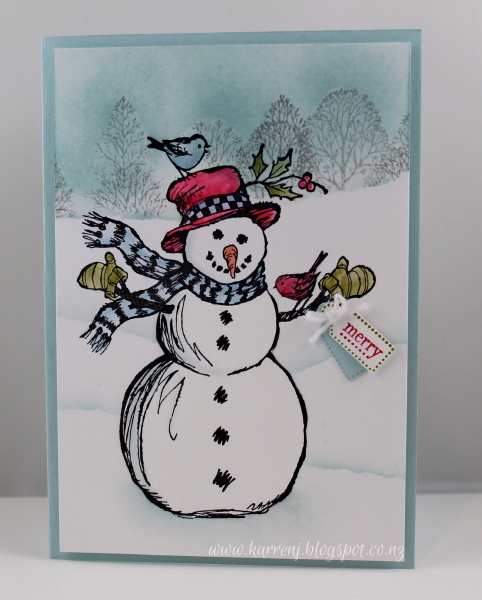 This snowman is particularly cute, with his scarf waving in the breeze and his birdie friends come for a visit. I stamped Mr Snowman then masked him using Eclipse Masking Tape. I then used more masks to sponge some snowy hills. At the top I stamped the row of trees from Lovely as a Tree in Smokey Slate stamped off. I then sponged some Soft Sky ink for the sky. 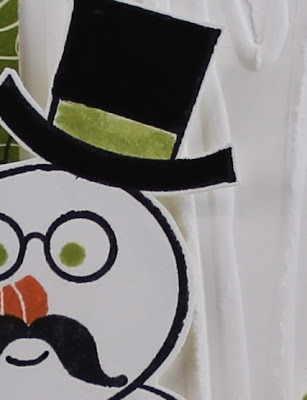 After I removed Mr Snowman's mask, I colored him using inkpads and a blender pen. There's not a lot of shading going on because the paper is not designed for laying down too much color. I popped Mr Snowman up on dimensionals and layered him onto a Soft Sky base. I then stamped a couple of tags and punched them out using the retired Jewellery Tag punch. 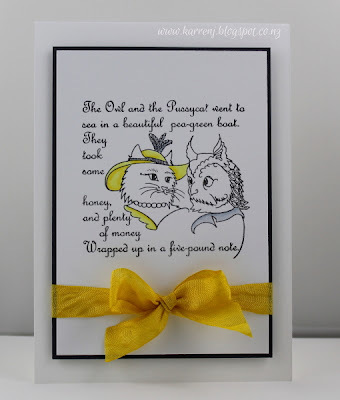 A tiny little Baker's Twine bow finished off the card. Thanks for looking. Have you checked out the rest of the Design Team's snowmen cards? Such talent! 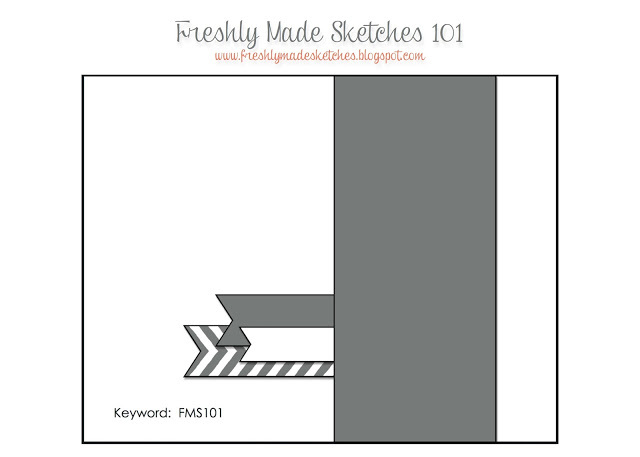 I'd been pondering the sketch at Freshly Made Sketches for a couple of days and couldn't come up with anything to make. 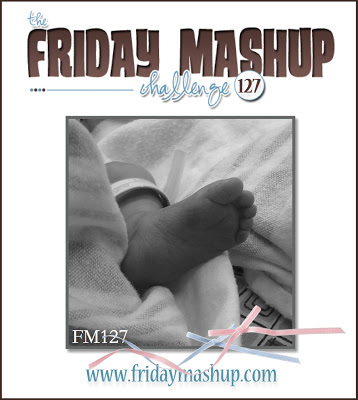 But then I saw the challenge at Friday Mashup and finally had an idea! I looked through my stamp sets for a fall-ish set and came across Gifts of the Earth. So I stamped the harvest image onto some Watercolor Paper and colored it using many, many different inkpads. (Edit: I just realised that what I thought was an eggplant is actually a marrow. So for the purpose of this card, let's all just pretend that this is a really, really big eggplant LOL) I then found some really old (2006) DSP called Outlaw and chose a couple of fall-ish patterns. One of the patterns had the two stars already punched out of it so I decided that rather than cut around them, I'd incorporate them into my card. The sentiment came from the Wetlands set and was stamped in Early Espresso onto the DSP. 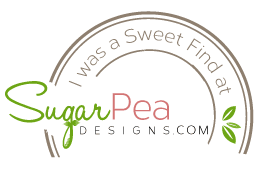 A couple of Pumpkin Pie Candy Dots finished off the card. 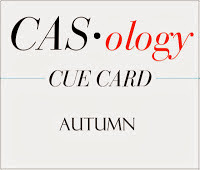 The challenge this week at Paper Players is to make a CAS card for kids. 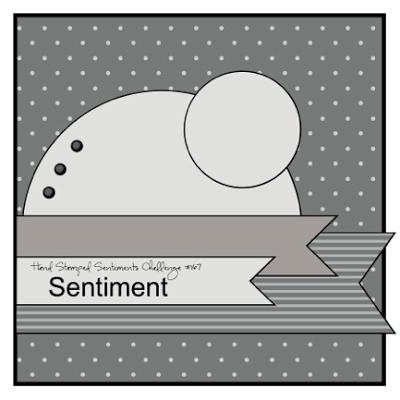 I combined that with the inspiration challenge at Stampin' Royalty to come up with this quick card. I stuck to the colors in the inspiration photo and the Owl and the Pussycat covers off the kids part. This is another really old stamp from Imagina Clarity in the UK. I used one of their images for a Christmas card here. This time I kept my coloring to a minimum using just a touch of color in each of the characters. The main image was back with some Basic Gray cardstock then some dyed Daffodil Delight seam binding was tied around before being stuck to the card base using dimensionals. This card uses the same layout as yesterday's card, but I really love this layout for CAS cards and have been using it a bit lately. 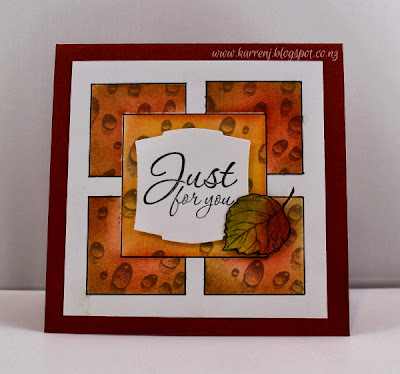 I'm just squeaking in with a card for this week's Just Add Frames challenge at Just Add Ink. 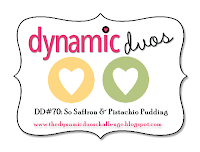 I also used the colors at Dynamic Duos which are yellow and soft green. 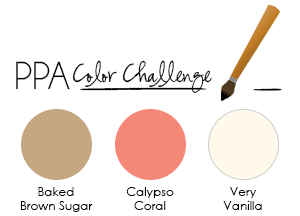 When I went to save the graphic to write this post, I saw the challenge colors were So Saffron and Pistachio Pudding. 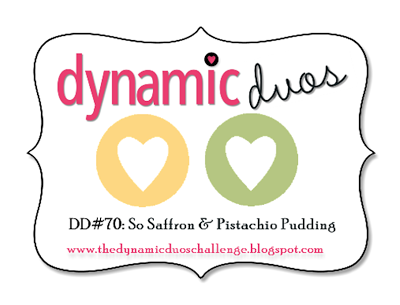 I went from memory and used So Saffron and Pear Pizzazz, so apologies to the Dynamic Duos team for my shonky memory! 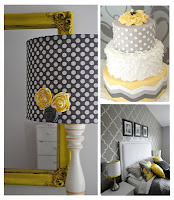 My frame was made using masking tape and sponging within the rectangle with both So Saffron and Pear Pizzazz inks. While the mask was still in place, I stamped some images from French Foliage in Crumb Cake ink. I then removed the mask and stamped the postmark images, also in Crumb Cake. Finally, I stamped some leaves in Pear Pizzazz. I layered this panel onto Pear Pizzazz then wrapped some White Baker's Twine around before mounting onto the card base using dimensionals. All up, this card only took about 20 minutes (which is quick for me!). Edited to Add: This card received an Honorable Mention at Just Add Ink. Use Red, Dark Brown, Vanilla and Champagne/Gold with some shimmer. While this card looks really, really long, it's actually just 8.25" long and 3.5" wide. 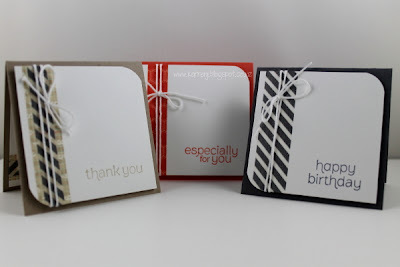 I made the card size to fit my images which were gold-embossed onto Very Vanilla then colored using markers. The horn was colored using Champagne Shimmer paint and a paintbrush which ended up more grey looking than champagne but c'est la vie. Thanks for looking. I urge you to check out the rest of the Design Team's cards and hopefully all the wonderful submissions we'll receive over the days to come. The challenge at SUO Challenges this week is to use your favorite technique. I was talking to my mum on the phone the other day and she mentioned a technique I'd taught in a class quite a few years ago. It's the Fossil Stone Technique. I haven't done it for a while, but it is definitely a fave - it's so easy to do and the results are always a happy surprise! 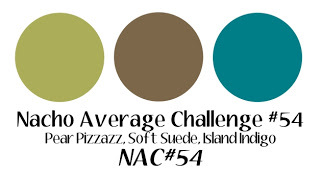 I combined this challenge with the color challenge at Nacho Average Challenges and the Thinking of You challenge at Friday Mashup. 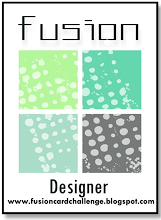 I made the fossil stone background without really knowing how I was going to use it. I smooshed Pear Pizzazz and Island Indigo inkpads into an acetate folder. I wanted a softer look so I then spritzed with water before putting some Glossy White cardstock into the folder and pressing it with my fingers. When I saw the finished pieces, I thought they looked beachy so pulled out my Wetlands set and some Soft Suede ink. The Island Indigo background piece and the banner piece are stamped with the World Map background stamp. I used the current sketch from Mojo Monday for today's card. 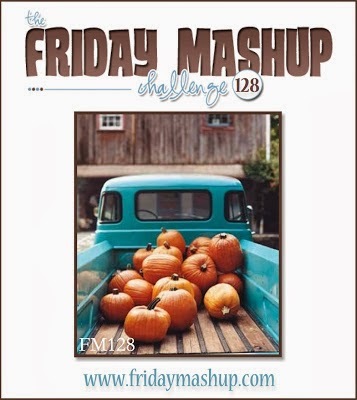 Edited to Add: This card was chosen as Top Nacho and Top Mashup Pick this week plus one of the Top 3 at SUO Challenges. 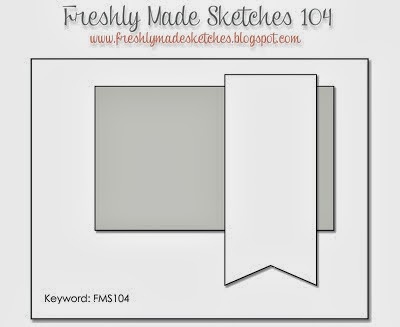 There's a great sketch this week at Freshly Made Sketches! It's one of those sketches that can be used over and over and look different each time. 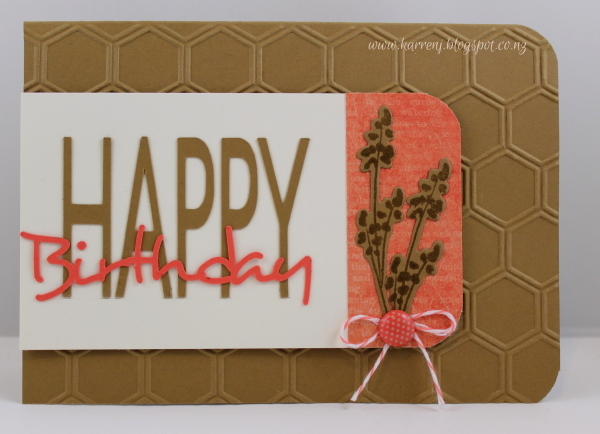 I combined it with the color challenge at Pals Paper Arts and the Anything Goes challenge at Seize the Birthday. 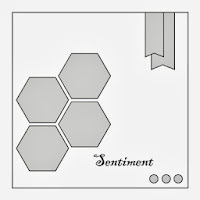 The sentiment is a cut file from the Silhouette store. I cut it in both Baked Brown Sugar and Calypso Coral. The main panel is popped up on dimensionals. The DSP is from Epic Day and is the paper with the faint hexagon pattern, which is why I embossed the card base with the hexagon embossing folder. The foliage is from the PTI set Larger than Life. 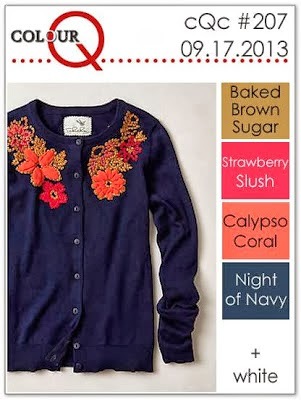 I finished off the card with some Calypso Coral Baker's Twine and one of the old In Color brads. 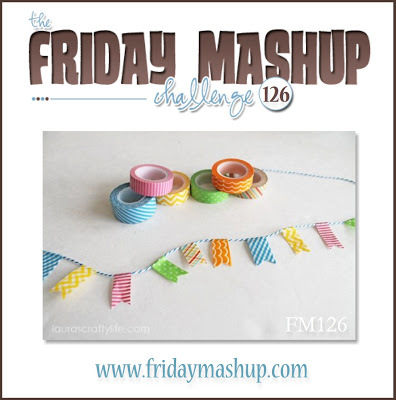 The challenge at Friday Mashup this week is to use washi tape and/or a set of 3x3 quick note cards. I only have one lot of washi tape because I just haven't really bought into the trend yet (I'm always late to the trend party!). These are very CAS cards. 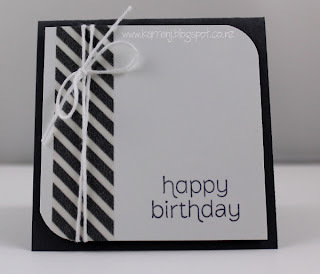 A strip or two of washi tape down the left side of a Whisper White panel; some twine, rounded corners and a sentiment and then they were put onto the bases using dimensionals. Create a project with "Washi Tape." 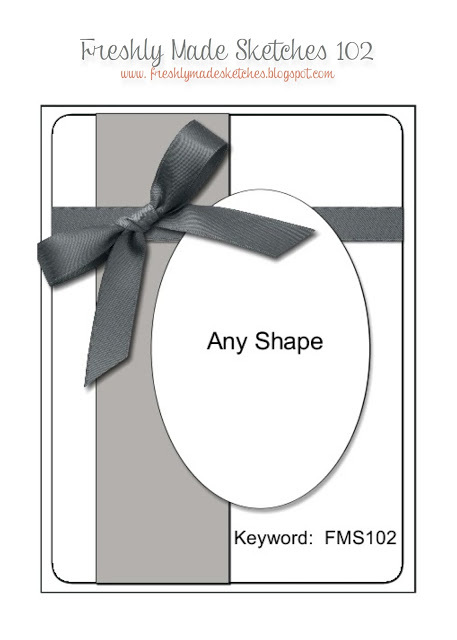 Create a "set of 3x3 Quick Note Cards." 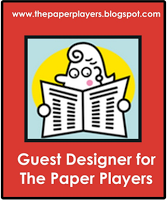 As mentioned in my post yesterday, I'm so excited to share that Lesley Croghan of Always Playing with Paper fame has asked me to join the design team at Merry Monday! And today is my first contribution. 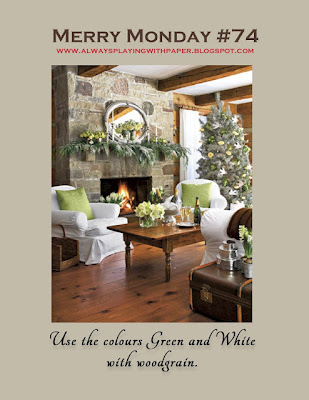 And here is the card I made using the theme of Green and White with Woodgrain. I used Lucky Limeade as my green and dug out the beautiful Candlelight Christmas DSP from last year. 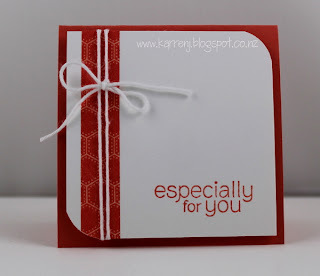 I stamped the sentiment before running a layer of Whisper White cardstock through the Big Shot using the Woodgrain EF. I did have to deviate slightly from the inspiration photo in order to give the Prof a nose, which was stamped using Tangerine Tango ink. It's hard to see in the photo but I gave him a bit of shading with my Soft Sky marker. 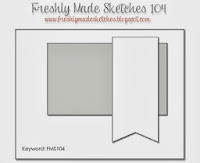 I used this week's sketch at Freshly Made Sketches, which is a very versatile sketch. 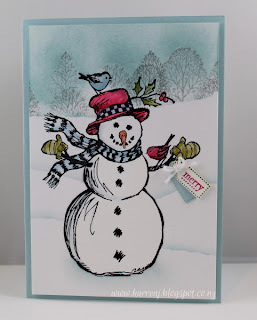 Thanks for visiting and go check out the other DT cards using the inspiration photo and have a go yourself - then you'll be one Christmas card closer to Christmas! I received a really exciting email during the week. 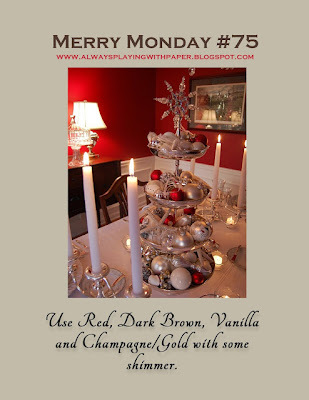 It was from Lesley Croghan of Always Playing with Paper fame (not to mention Queen of Challenge Blogs fame!) asking me to join the Merry Monday Design Team. 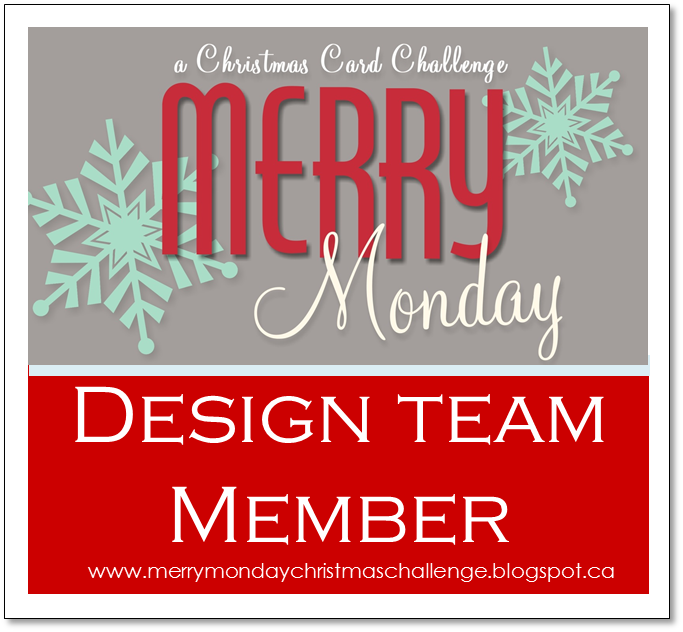 In case you don't know, the Merry Monday Design Team is a weekly Christmas card challenge - and who doesn't like the idea of getting Christmas cards made before the mad Christmas rush is upon us? 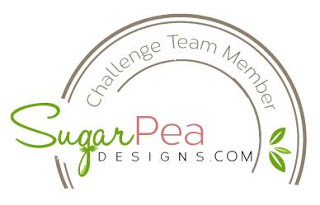 The Merry Monday challenges go live on Lesley's blog on Mondays at 5am (PST). That's midnight Monday night for us Kiwis. The challenge remains open until noon on the Sunday (that's about 7am on Monday morning here). 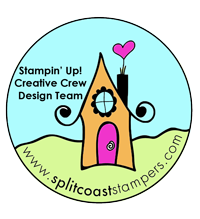 Check out Lesley's blog (link above) for all the deets, and while you're there, check out her mad stamping skills! Here's a sneak peek of my card for this week's challenge. So check back tomorrow for the full card and make some plans to join in the fun. I sat down today to make a card for this week's Freshly Made Sketch Challenge and decided to use the colors at Just Add Ink, which are absolutely stunning together I might add! 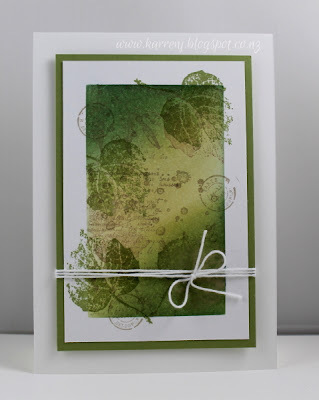 For today's card, I started with a piece of Whisper White cardstock and sponged Bermuda Bay ink on it, making sure to not make the sponging too even. 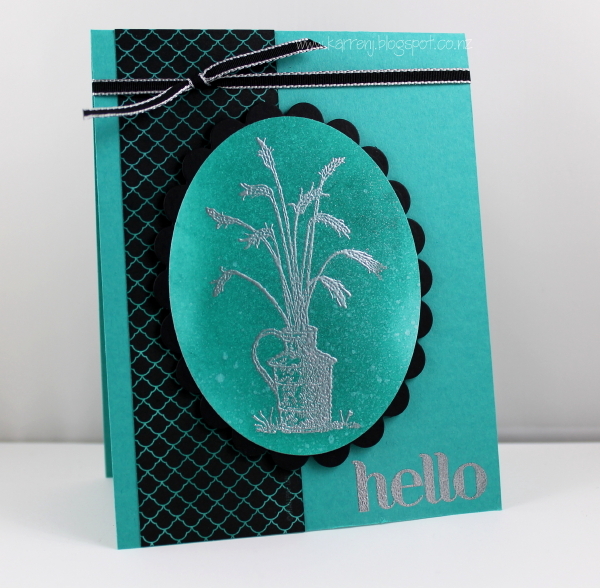 Once that was done, I silver-embossed this gorgeous reed image from the retired Always Thankful set. 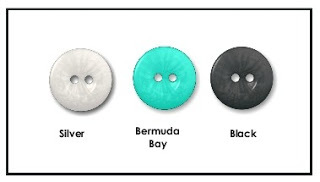 I then went over the image again with more Bermuda Bay ink to darken the background around the image. 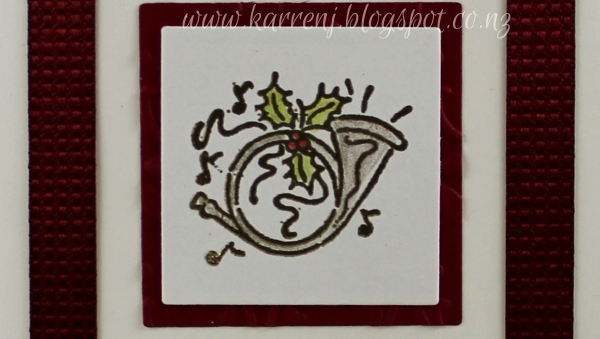 Finally I spritzed the image with some Silver Smooch Spritz and cut with an oval nestie. I took some Basic Black DSP from the Neutrals stack and sponged Bermuda Bay ink over it to tone down the white. 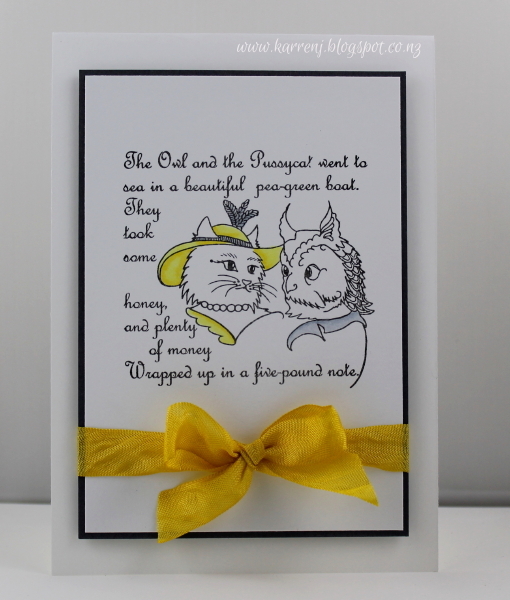 The sentiment from Four You was silver-embossed onto the card base. 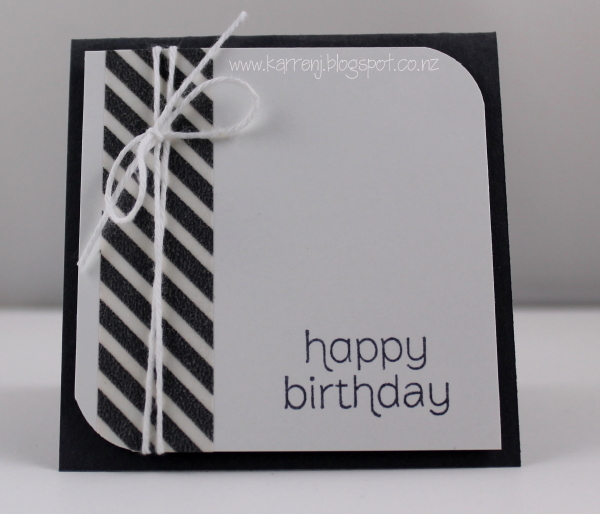 Some Basic Black taffeta ribbon finished off the card. I originally had the retired black satin ribbon but it looked too heavy for the rest of the card so I swapped it for this narrow ribbon. I used the sketch from Hand Stamped Sentiments and the 1-2-3 challenge at Friday Mashup. 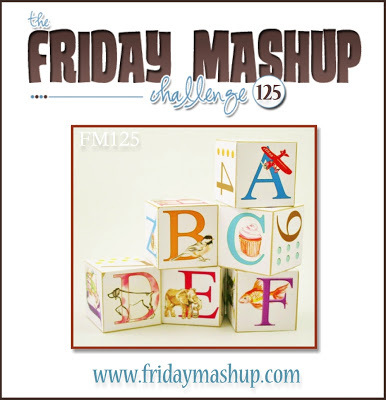 Create a project with using "A-B-C (use elements on your projects starting with the letters A, B, C). " 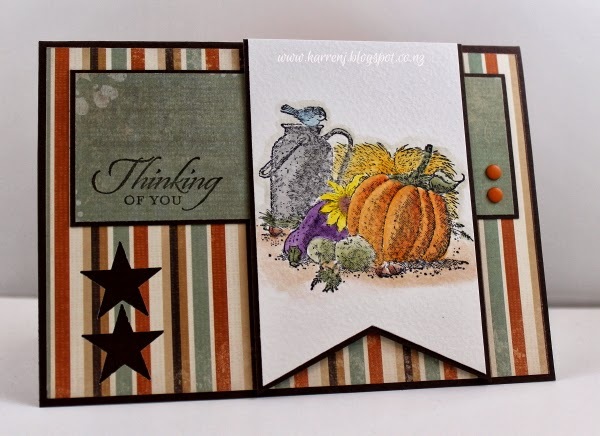 Create a project using a "1-2-3 card recipe (1 embellishment, 2 Stamp Sets, 3 Colors) ." Or Mash it Up and create a project "A-B-C & a 1,2,3 card recipe. " This card fought me the whole way as I was making it! It was just one of those days and it finished in spectacular manner when Dexter the Dog managed to entice the sentiment stamp off my desk and into his mouth. I heard a crunching sound and when I investigated the wood block was full of teeth marks and the "F" from "Father's" on the rubber side was gone! So that's that, then. Until "Ather's Day" becomes an official holiday, my stamp is in retirement :) I'm only grateful it was a single stamp and not part of a set. Anyway, enough chatter. Here's my card for this week's sketch at Freshly Made Sketches. I realised on Friday that Father's Day is this Sunday in New Zealand and while I'd made a card for my dad months ago, I hadn't made one for DH. So this was a bit of a rush job. I used Modern Medley DSP and the new chevron punch. 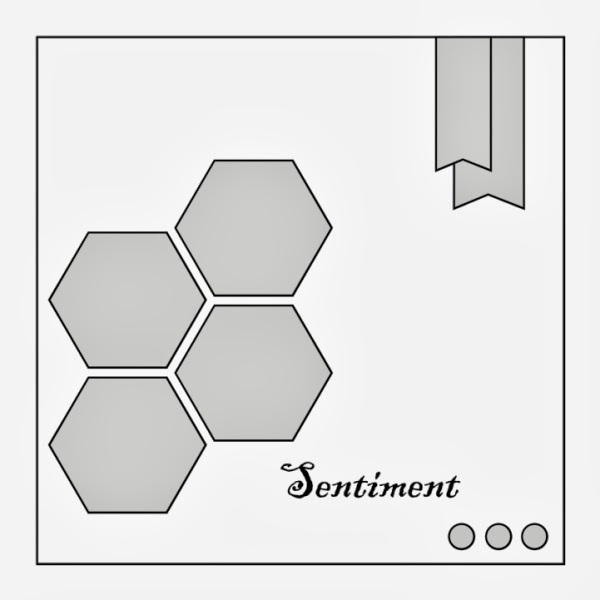 As I mentioned above the sentiment stamp is a singleton that I've had for some years. I didn't follow the sketch exactly but I hope it's similar enough to pass muster.